Given the year round cycling and presence of world-class racers around here, it's difficult to spend a lot of time on the guitar. There's the time on the bike, of course. But the time off the bike is often spent vegging-out...staring at a computer monitor with a vacant expression - the result of glycogen exhaustion, I guess. You have to expend any energy remaining to keep up with the chores. Everything grows fast down here, and just like up North, the weeds outgrow everything else. But cooler weather is slowly arriving, and the days are shorter. Tonight will be the last evening assault on Paris Mountain. I'm gradually inspired to make more music. When you don't play the 12-string every day, you find your fingertips losing the callous and becoming more tender. I tuned down a half-tone and this makes playing much easier. Now I want to come back to full tension and harden up the tips, enjoy the resonance and body of strings and correct tension. Now it's too difficult to play some passages that were easier at the lower tension. There are some bars in the middle of the Bach C natural Prelude that require some tricky barring and fast hand position changes; easy before, now getting muffed. The height of the strings for 1 and 2 is taken using the 1st and 6th course. Number 3, which is a measure of neck relief, is taken with any string. 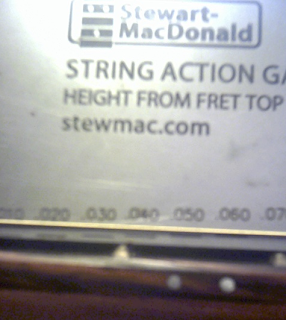 There are formulas using dimes and pennies, but I found a Stewart-MacDonald tool that is worthwhile investment for a 12-stringer: the String Action Gauge. You hold it behind the string you are measuring and line up the bottom of the string with the bottom of one of the lines. Just slide it back and forth until one lines up, or is close enough to approximate. The Taylor 12-strings come from the factory with the 6th course at 5/64 (.0781) inch and the 1st course is 3/64 (.0469) inch. The LKSM is set up a little lower. These measurements are done with the neck straight. In other words, they set up the action at the 1st and 12th frets with no relief in the neck. After the string height is set, they add the relief. This is probably best left to a competent technician. The string height above the first fret is lowered by filing the string slots out. You need nut files. These come in various gauges. I use these, very, very carefully. It's a lot harder to unfile. I hold a feeler gauge on the fretboard next to the nut while I'm filing so I don't go down too far. Happily, this is not something one has to do often. The saddle height controls this. There are lots of guides on saddle sanding. Here's one. There's also some info at Bob Colosi's site. Neck relief stops the strings from twanging against the frets while they vibrate. The strings tend to swing at their widest around the middle of the fretboard, so the neck is bowed a little away from the strings. Finger pickers tend to use little or no relief. Here's more info from Taylor. Humidity, or lack thereof, often upsets your careful adjustments. Sometimes the dehumidifier won't keep up in the Summer, or the humidifier doesn't crank out enough moisture in the Winter. In my house the guitar room runs about 15% lower humidity in the Winter, despite my best efforts. So I have Winter saddles and Summer saddles. I loosen the strings till they are slack. Then, to make sure they don't get tangled up when swapping saddles, I put a capo on the 7th or 8th fret. With the capo on, and if the strings are slack enough, you should be able to pop the bridge pins out. If they're stuck a little, use a wire cutter gently around the pin using the saddle as a fulcrum. Once the pins are out you can remove the strings from the bridge holes. Reach through the sound hole to unhitch any strings that are stuck. Swap the saddle, pop in the strings and pins, and tune 'er up.